For something we spend hours and hours working with, the keyboard spent a long time as strictly a tool with little mind to either mechanics or aesthetics. We had ergonomic and regular and black and beige. For a long time, even getting a mechanical keyboard meant digging up an old IBM keyboard. Now, peripheral makers are scrambling to create a web of different keyboards to meet every imaginable use-case, from MMO gamers to professional gamers to serial typists. Each keyboard gets a special collection of features that tries to address specific audience. With its new G413 Mechanical Gaming keyboard, the primary need the company wants to address is budget. At a retail price of $89.99, that might sound like a joke to some, but the G413 is $30 less expensive than the next-cheapest mechanical keyboard in Logitech's lineup and $40 cheaper than the next-cheapest keyboard that uses Logitech's proprietary Romer-G switches. From Logitech's perspective, then, the G413 meets its primary goal. How is it as a keyboard? What sets the G413 apart from Logitech's previous planks and many others on the market is the look and feel of the keyboard itself. This thing is metal. In the literal sense. Most keyboards are primarily plastic in build, with the keys inset into the top frame. Logitech has done away with the top frame altogether and instead we have a raised-key look, with the keys sitting atop a base made of aircraft-grade aluminum. That alone gives it a striking look and a rigid feel. There isn't nearly as much flex in the G413 as there is in most other keyboards. A side bonus to the stylistic choice is that it's easy to clean. The brushed aluminum doesn't pick up fingerprints – at all, really – and the raised keys mean you won't be digging nearly as much get the inevitable collected gunk out from the keyboard's depths. Mechanically, this thing is identical to Logitech's other Romer-G keyboards, especially the G Pro keyboard (though it features the ten key that that board is missing). The mechanics underneath the keycaps are the same Romer-G switches we've seen so far. This is the second board after the G Pro to feature the improved key signal processing speed that board sported, though Logitech's Technical Marketing Manager Andrew Coonrad tells me the improved KSP will be making its way to other Logitech Romer-G keyboards via firmware update sometime in the near future. 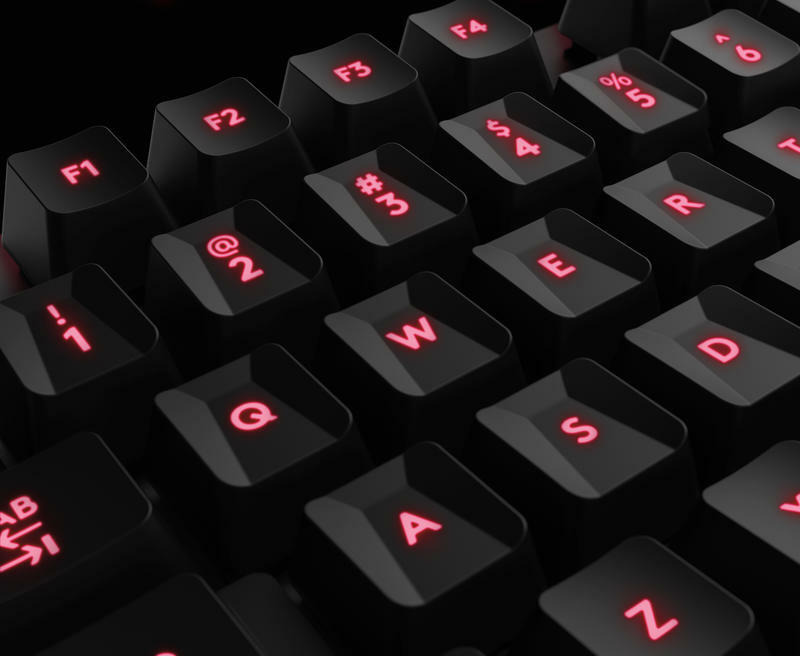 The lighting is as bright and attractive as ever, though this keyboard features just red lighting, unlike most of Logitech's other gaming keyboards. You can do adjust the brightness of the lighting and make it breathe, but there's not as much customization as there is on Logitech's RGB keyboards. The rest of the board is a collection of great features and weird quirks that could make or break the board for many. One of my favorite features on the keyboard is the USB 2.0 pass-through port. When left unused, it sits subtly on the upper-right corner of the keyboard, out of sight. If you plug in the second USB jack, though, you can then use that to plug in something like a wireless mouse receiver, which is what I used it for. This puts the receiver much closer to the mouse and eliminates a lot of the metal and electricity that could interfere with the signal. Like other Logitech G keyboards, the Function keys can be reprogrammed to perform other functions. I have one, for example, set to turn off my monitors all at the same time. But in lieu of dedicated media keys, Logitech has taken the same tact they took with the G Pro and given the keyboard an FN key with which you can play, pause, and otherwise manipulate your media. In the Logitech software, you can invert the FN key functionality, making the media functions the primary function of those keys, while the standard functions require the FN key to be pressed. I'm not sure I'll leave the keys inverted like that, but I control my media a lot more often than I hit F11 or Print Screen, so it's a nice bonus. The board does have a few quirks worth mentioning. One is that Logitech has omitted a NUMLOCK light from the keyboard's status display. There are lights for caps lock and game mode (which disables the Windows and other use-specified) keys, but the light for the NUMLOCK key is conspicuously missing. Instead, when you hit the key, it pops up an overlay on-screen. For me, this becomes annoying anytime I reboot my computer, as my current config, for some reason, absolutely refuses to respect my keyboard's NUMLOCK status, regardless of keyboard or port. Feel free to hop into the comments to let me know how bad I am at computers. I can struggle through it, and it rarely is an issue otherwise, but a keyboard with a ten key pad and no NUMLOCK key seems like a weird omission. One oversight I want to reiterate from the G Pro keyboard is how Logitech is under-utilizing that FN key. With an FN key, every key on your keyboard could theoretically have a secondary function – not just the media keys. You could customize this thing to the nines and make it do all kinds of wild tricks that make no sense to anyone but you. I really hope this is something Logitech can introduce in a future firmware update. My biggest issue with the G413 might be a defect with mine, but I feel I should bring it up here. The spacebar, at times, would catch during use. Now, during typing, I don't remember it happening at all. For me this was when I was playing games. A bit of tinkering suggests to me that the problem is in how the spacebar lies on the guides on the left and right sides that keep the whole thing level and even. When I'm typing, my thumbs sit to either side of the spacebar's center. When I play games, though, my right thumb sits on the very corner of the key, and that seems to be the way to reproduce it. I don't have this issue with other Logitech keyboards. With how similar it is to other boards, I'm tempted to chalk this up to a manufacturing defect and not a problem with the model. The G413 also offers up a couple other features that didn't really do anything for me personally, but they're worth mentioning here. Underneath the keyboard are a pair of cord guides that will let you run a cord directly under the keyboard. 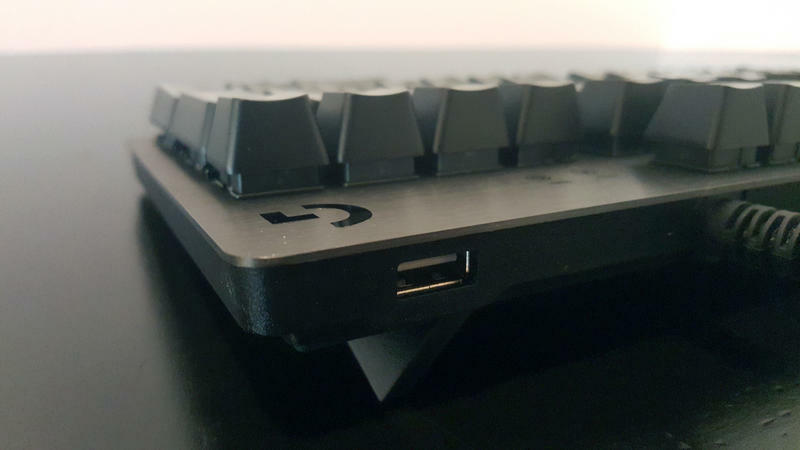 And while the keyboard's standard keys are the usual, slightly convex keycaps we know and love, the keyboard comes with a set of "contoured" keys that provide a deeper divot that some people like for use with gaming. I don't really like them, but they're there for those who like them and optional for those who don't. The G413 is, if you're looking for a slightly cheaper mechanical keyboard, worth a try. While we tend to buy our stuff online these days, it wouldn't be a bad idea to give this one a try in real life first. Logitech has supplied Best Buy with its own model featuring silver aluminum and white lights instead of the carbon looks with red, so it should be pretty easy to find and give a chance. I'm sticking with my G810, but at $70 less? This isn't a bad option at all. Logitech is putting out keyboards at a breakneck pace lately, so you might wait to see if they go even further down the budget path, but it's unlikely you'll regret this one if the look trips your trigger. 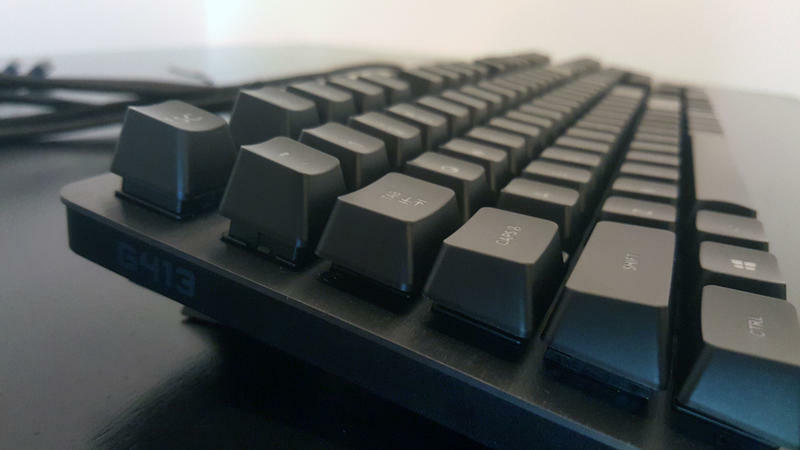 Disclaimer: I spent 10 days using the G413 as my sole keyboard for 8+ hours a day most days before writing this review.